Silver Muse is simply divine. My Silver Muse review explains what makes this ultra-luxury cruise ship so good. I detail each of the restaurants and I reveal the beautiful suites. Also, I preview the entertainment options, plus there are exclusive video tours so you can see what Silver Muse is really like. Simply click on the tabs above to view each section of this review. Silver Muse takes ultra-luxury cruising to new heights. There are more restaurants, bigger suites and even more luxurious amenities than ever before. This luxury cruise review explains it all. Silver Muse debuted in April 2017 and is the ninth ship in the ultra-luxury Silversea fleet. In fact she was the first in a new more spacious class of cruise ship. Silver Muse has room for 596 guests which is 56% more than Silver Whisper and Silver Shadow, but about the same as Silver Spirit. Lengthened Silver Spirit at sea again. Silver Muse has beautiful and spacious suites. Silver Muse is a beautiful luxury cruise ship offering the highest expression of Italian style and comfort. In fact, guests enjoy all-suite accommodation and almost every suite has its own private veranda. The larger suites even have separate bedrooms and spa-style bathrooms. 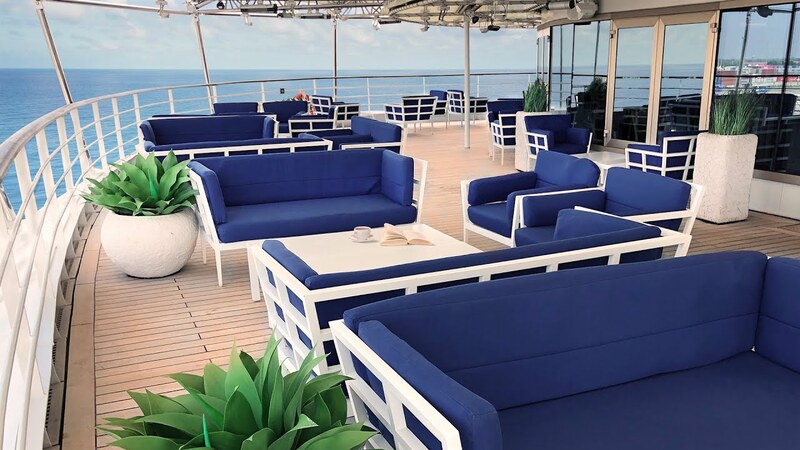 See the Silver Muse Veranda Suite. The Silver Muse Silver Suite is like a one-bedroom apartment. Silver Muse has that unmistakable Silversea style. The decor is clean and contemporary in a palate of earth and cream tones, with lively splashes of blue. There are also pieces of fine art hang from the walls and modern sculpture is scattered throughout the public areas. Silver Muse is filled with original artwork. The layout will be familiar to Silversea regulars. On Silver Muse all the suites are positioned midship and forward, while the dining and entertainment venues are at the stern. Because of this there is never any noise disturbance. Silver Muse is a haven for foodies. In fact there are eight restaurants to choose from including an al fresco pizzeria as well as Le Dame, which is the only Relais & Châteaux® restaurant at sea. However, it is worth noting that there is no main dining room. Read about the Silver Muse restaurants. Discover the Silver Muse pool and spa. After all that eating you can work off unwanted calories in the well equipped gym. The Zagara spa also has a range of indulgent beauty packages to make you look great too. On my Silver Muse review voyage the service was outstanding. There are roughly two staff members for every three guests. As you will see from my Silver Muse review, the ultra-luxury Silversea experience has been redefined. Like all the luxury cruise ships in the Silversea fleet, Silver Muse is all-inclusive. Once you get onboard there is no need to pay for anything else. Your cruise fare includes dining in all but two of the restaurants. Only the specialty restaurants Le Dame and Kaiseki have a supplement (US$60 per person). French Champagne is included in your Silver Muse cruise fare. Also included is an extensive selection of new and old-world wines, Champagne and top-shelf spirits. When I sailed the house Champagne was Heidsieck Monopole Blue Top Brut. It was a lovely drop! You can purchase additional premium alcoholic beverages from the Connoisseurs list, but on my Silver Muse review sailing I thought the house offerings were excellent. Also included in the cruise fare are specialty teas and coffees. Gratuities are also part of your cruise fare which means tipping is not necessary. However, at the end of your cruise you might like to leave your room attendant or butler a small reward for great service. Transfers from the port into town are included as well. It’s another of the many Silversea benefits. Free bottled water is also available to take ashore, but we encourage you to reduce the use of single-use plastic bottles. Also included in the cruise fare are luxury European bath products from Bvlgari. Silver Muse has more restaurants than any other luxury cruise ship. In fact, there are eight different restaurants to choose from. So the toughest decision of the day is likely to be where to dine! Thankfully this Silver Muse review rates them all. Indeed dining on Silver Muse is a foodies delight. The food quality and presentation in all the restaurants is generally excellent. And now caviar is back on the menu too. Interestingly, Silver Muse does not have a main dining room. However, the new Atlantide restaurant seems to have assumed this mantle. In fact, the popular venue has become pivotal to the Silver Muse dining scene. The menu is mostly European and changes every three days. La Terrazza is a Silversea classic. On Silver Muse the restaurant continues to produce some of the best pasta dishes on land or sea. Le Dame is one of two specialty restaurants on Silver Muse. The intimate venue has a mouthwatering menu by top chefs from the team at Relais & Châteaux®. It is not to be missed! The other specialty restaurant is Kaiseki where master chefs serve exquisite Japanese teppanyaki. Indochine is a new pan-Asian offering on Silver Muse. It serves some delightful dishes from across the Asian continent. There is also Silver Note. It is a jazz-style supper club that pairs small-plate dishes with great music until late. The Silver Muse dining repertoire is rounded out by two al fresco venues. There is Spaccanapoli – an authentic Naples-style pizzeria. Plus, the poolside Grill where guests cook their own food on hot lava stones. My Silver Muse review rates each restaurant. I also include video tours so you can see what they are really like. The Silver Muse dress code is more traditional than on other luxury cruise lines. It ranges from casual to formal depending on the time of day. The dress code is advertised in the Daily Chronicles. In public areas the dress code is smart resort-wear during the day. After dark the dress code will be either casual, informal or formal. The Daily Chronicles newsletter will advertise this. Casual: For men casual-wear means open-neck shirts and slacks, while for ladies it’s pants, blouses, skirts and casual dresses. Informal: Informal wear includes jackets for men (tie optional) and dresses or pantsuits for ladies. Formal: On formal nights men should wear a Tuxedo or dark suit and ladies should wear an evening gown. The number of formal nights will depend on the length of your voyage. Cruises of less than 10 days have one formal night, cruises between 10 and 13 days have two, while longer cruises have three formal evenings. On formal nights guests can choose informal wear for dining in La Terrazza, Kaiseki or Silver Note. Although during my Silver Muse review voyage most guests enjoyed dressing up. The Grill and Spaccanapoli always permit casual wear. Silver Muse is one of the newest luxury cruise ships, so she is very popular no matter where in the World she sails. Indeed, Silver Muse guests have seen the World and are discerning. They generally range in age from 35 to 70-years old. Sometimes there may be families with children onboard. Silver Muse has a dedicated kids club to cater for this on certain sailings. However, Silver Muse is not especially child-friendly. On my Silver Muse review voyage most guests were from the U.S.A, Australia and the U.K, but Canadians and Europeans were also onboard. It’s also worth noting that Silver Muse is gay-friendly. Silver Muse raises the bar for ultra-luxury cruising. The spacious veranda suites are the largest in their class. The eight restaurants offer a culinary voyage of discovery. And the recreational facilities are unrivaled. Silver Muse really is divine. Read the accommodation section of our Silver Muse review by clicking the button below.